Q: Where is the retreat held? A: Timber Wolf Lake. A Young Life camp and retreat center. Visit them on the web HERE. Q: How do we get to retreat? A: We carpool or you can come on your own. Q: Is it only for Ogden men? A: No way! All men (18 and older) are welcome! Q: What do we do at Men's Retreat? A: We will worship together, learn together and play together. There will also be "down time" for you to have some fun in the snow, or hang out in the rec room with pool tables, ping pong, and more. Or you're welcome to bring your favorite book and just relax. A: You, your Bible, clothes toiletries, snacks to share, monetary donations for our speaker and work crew, CPAP machine, extra pillow/blanket if so inclined. We’ll take some time and worship, pray, study the Word and sit by the fire. Then we’ll have some fun! The options are endless! There is a full gymnasium for volleyball, basketball, or Corn Hole. 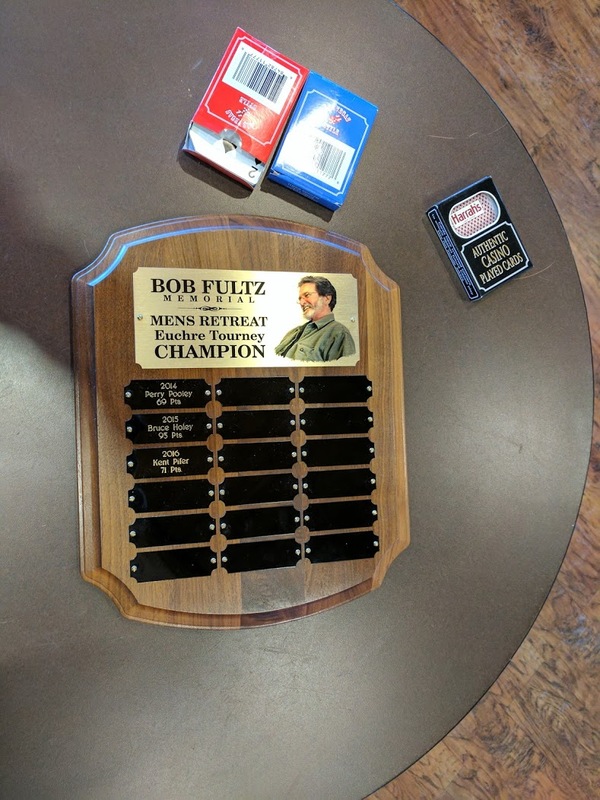 We’ll have the fourth annual Bob Fultz Sr. Memorial Euchre Tournament as well. Other indoor activities include: billiards, ping pong, sleeping, relaxing, snacking, and lounging. Outdoor activities include: hiking/walking trails, tubing, skiing, and snowball fights. Cost traditionally runs $110 per person and includes all meals and activities.